PATEK PHILIPPE REF. 2497 YELLOW GOLD FIRST SERIES Patek Philippe & Cie, Genève, No. 888085, case No. 683855, Ref. 2497, First Series. Made in 1953. 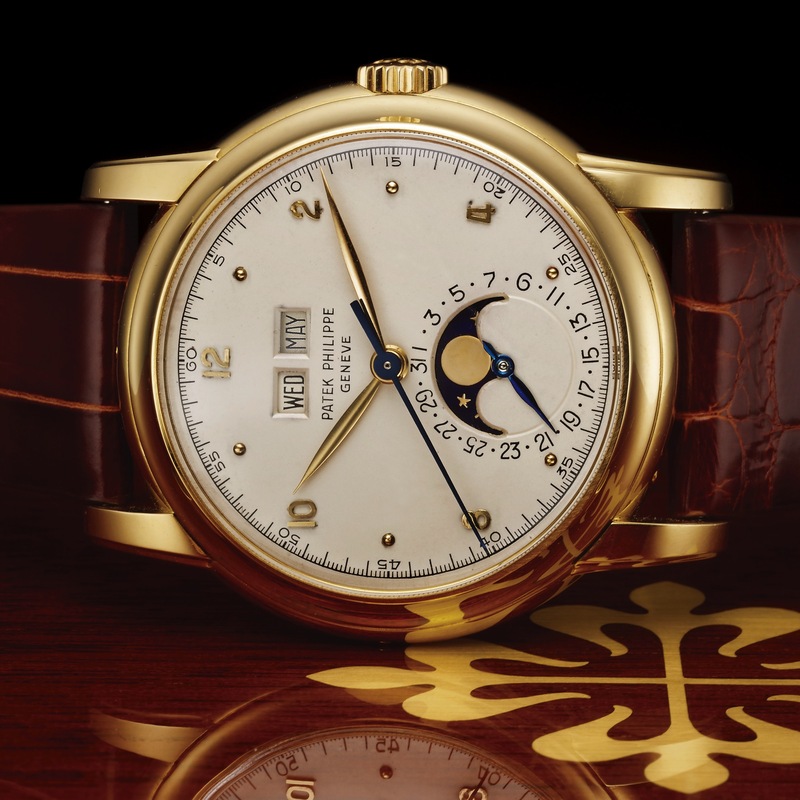 Very fine and rare, astronomic, center seconds, 18K yellow gold wristwatch with perpetual calendar and moon phases. Accompanied by an Extract from the Archives. Three-body, solid, polished, snap-on case back, concave bezel, fluted and curved lugs. Matte silver with applied yellow gold Arabic numerals and dot indexes, outer 1/5th seconds track with 5-second Arabic markers, graduation for the days of the month, apertures for the days of the week, the months and the moon phases. Yellow gold feuille hands. Cal. 27-SC Q, stamped with the Seal of Geneva quality mark, rhodium-plated, fausses côtes decoration, 18 jewels, straight-line lever escapement, cut bimetallic balance adjusted to heat, cold, isochronism and 5 positions, shock absorber, self-compensating Breguet balance spring, swan-neck micrometer regulator. C. Three-body, solid, polished, snap-on case back, concave bezel, fluted and curved lugs. D. Matte silver with applied yellow gold Arabic numerals and dot indexes, outer 1/5th seconds track with 5-second Arabic markers, graduation for the days of the month, apertures for the days of the week, the months and the moon phases. Yellow gold feuille hands. M. Cal. 27-SC Q, stamped with the Seal of Geneva quality mark, rhodium-plated, fausses côtes decoration, 18 jewels, straight-line lever escapement, cut bimetallic balance adjusted to heat, cold, isochronism and 5 positions, shock absorber, self-compensating Breguet balance spring, swan-neck micrometer regulator. Dial, case and movement signed. DIAM. 37 mm. THICKNESS 13 mm.